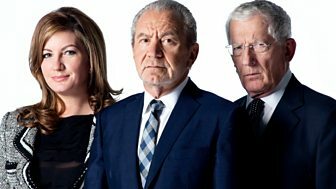 Series in which candidates compete to go into business with multi-millionaire tycoon Lord Sugar. Join Radio 1 presenter and Apprentice superfan Matt Edmondson for his hilarious take on this series of The Apprentice. Meet last year's candidates who competed for Lord Sugar's £250,000 investment. Radio 1 presenter and Apprentice superfan Matt Edmondson shows you his last Funny Bits. The winner of The Apprentice 2012 has won a £250,000 investment from Lord Sugar.